This Step-Up Stirrup helps solve the age-old problem for those that have a saddle horn of not being able to comfortably and confidently step up in your stirrup without the use of a mounting block. 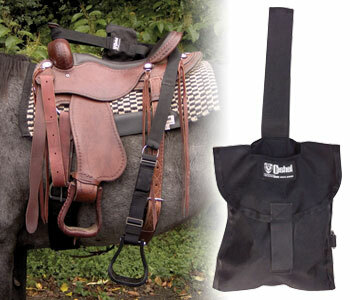 It conveniently stores in its own bag so you can use it to get up, put it back in the attached bag and carry it on your saddle horn out on the trail in case you need to remount. To use simply attach the loop on the Step Up Stirrup to your saddle horn and pull around the back of the cantle to create the extra step you need. Adjust It's stirrup lower the the saddle stirrup and use the opposite foot in the Step-up Stirrup to create an extra step.